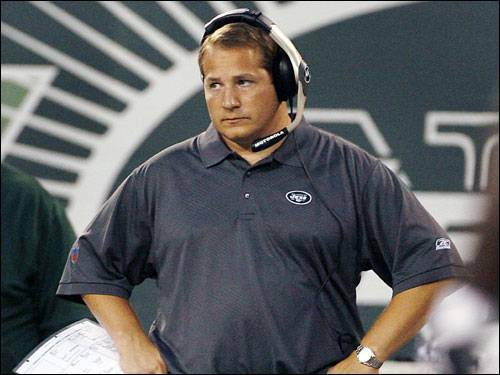 I wish I had a screen capture of the sad kitten face Coach Mangini made in the waning seconds of this afternoon’s deflating loss to the Bengals. What I saw as the clock ticked down to zero was a beaten man who knows his ship has sailed. And sailed it has, Browns fans. If last week’s dull defeat to Buffalo didn’t cement Mangini’s fate, today’s depressingly similar “effort” - and I use that word loosely- against Cincinnati certainly did. A victory today, along with some home cooking against either Baltimore or Pittsburgh, may have barely saved Mangini’s job - with the caveat that he would need to replace a couple of his coordinators if he wanted to keep the position. Any “Mangini stays” scenarios are likely ashes now. Even two improbable wins in a row against division powers probably won’t be enough to sway Mike Holmgren. All the team president has to do is look at the last two weeks of game film to a see a coaching staff that does not get the most of what talent it does have. Shoehorning Peyton Hillis up the middle on the 3rd-and-1 fourth-quarter goal-line play is a call everyone knows is coming – why not run a little play action with your mobile quarterback and your very good pass catching tight end? The horrendous clock management at the end of the second quarter was equally damning for Mangini and his staff. The forehead-smacking sequence that included a sack, offsetting fouls, a false start and a punt will not be something that the soon-to-be-ex Browns bandleader puts on his demo tape this off-season. Most disappointing is the lackluster effort the Browns have brought over the last two weeks against squads with a combined four wins. They are very simply getting controlled at the line of scrimmage, with the power football that’s ostensibly the Browns’ identity being used against them with maddening effectiveness. Giving up 190 yards on the ground against a Cinci rushing attack ranked 30th in the NFL is unacceptable, folks, as was the lack of any type of pass rush against a struggling Carson Palmer. Offensively, the ground game wasn’t there for the second straight week. Neither was the protection for Colt McCoy, who despite a few questionable throws and a needlessly taken sack or two that we can lovingly chalk up to rust, looked very good even after a month on the sidelines. If you’re looking to think happy thoughts about the Browns’ progress this season, think no further than #12. Otherwise, the Browns’ exciting mid-season wins against New Orleans and New England now seem like they took place during a different year. While the 2010 Browns can hang with anyone, you just don’t know if they’ll be prepared to play their best from game to game. Ultimately, that very unpredictability is probably what’s going to cost Mangini his job come Jan. 3.